The veil or mask of life is perpetuated in change, transformation, and passage from lower to higher. I suppose it would be remiss if this blog, whose focus is supposed to be my transgender experience, didn’t discuss transition-related happenings that occurred during the week my dad died. There were several developments worth noting. But before I get to them, I want to talk about the Tarot. I am an atheist and a skeptic, and I have been since college. In high school, though, I had a “woo” streak in me a mile long. I read all the books by von Däniken; I knew all the theories about Bigfoot and Nessie; and I routinely tested myself for psychic powers. Though I never really mastered the gimmick of fortune telling, I always enjoyed studying the symbolism of the Tarot. There’s a lot of human folklore, psychology, and superstition built into each card, and how one chooses to interpret each one says as much about the person as it does about the Tarot. 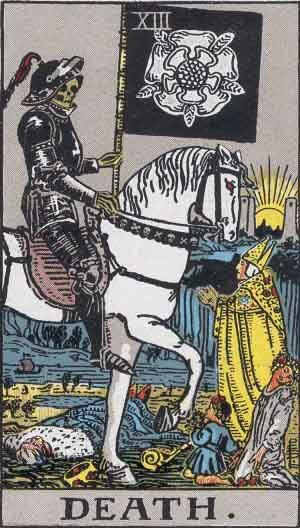 The Rider-Waite Tarot, especially, was designed by its creators pre-loaded with all sorts of mystical mumbo-jumbo. It’s a real iconography salad. And this means that every card can mean more or less anything the reader chooses it to mean. Take the Death card, for example. In horror movies, this card usually means the unlucky character who draws it it about to be violently murdered. But in Tarot reading Death is much more metaphorical. It means endings, and while it can mean a literal death it can also be read as metaphor for just about anything either ceasing to be or ceasing to happen. It is not a bad card, nor is it a good card; it’s a neutral card, because endings themselves are never entirely bad nor good. For example, my marriage ended last year, which at the time seemed like a bad thing; but as I’ve noted extensively in this blog, it turned out to be one of the most important things ever to happen to me because it allowed me to become the woman I am today. In Tarot reading, the notion is that some other card in the layout will usually put perspective on the Death card, to help indicate the nature of the ending. 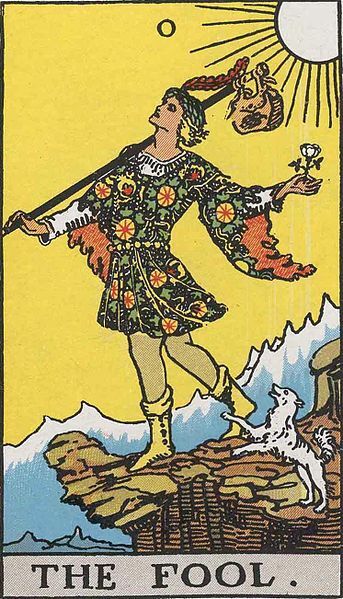 One card I was always fond of finding in such a position was The Fool, a card that very much meant beginnings. Free-spirited, careless, full of potential but also full of risk — this is the Fool, the spirit of opportunity, the beginning of a journey of uncertain destination. In a lot of ways, I was playing the Fool when I started this blog, when I ended my marriage, when I almost ended my life. Those were all endings, but they were also beginnings. Again, this isn’t something I believe in, in a spiritual or mystical sense. But these things are created by humans, and as such they come loaded with the shared human experience. Endings do lead to beginnings, and beginnings can be uncertain. As metaphors, these cards ring true. I’m going off on this tangent, I suppose, as a way to explain the next several posts I write. The recent passing of my father was very much a tragedy for me, and it was an ending in the most final sense. I will never get him back; I will never talk to him, or laugh with him, or try to explain something to him, or tell him about my kids. That part of my life is at an end. At the same time, the week my dad died also very much represented a beginning for me that was in many ways quite positive. And I don’t want to write about them as though I’m callous, thoughtless, or indifferent to my dad’s passing. But I am also not going to play the Fool, who wanders unknowingly towards the uncertain future. My dad loved me, and I would like to think that he’d be okay with me finding something good in this tragedy. So I’m going to recognize what has happened, embrace its positive aspects, and let them lead me knowingly into the next chapter of my life. the fool also indicates that the person soon to be parted from her money needs to stop starkng at the figurative clouds and pay attention to where she’s putting her feet. I remember reading about that aspect. As I understand it, that’s something often built into the imagery RW deck and the more esoteric decks, but not universally assumed. Probably good advice, though.